In response to Cllr Little’s request for a ‘top 10’ Priority list, TCAG have issued a number of items to feed into the over all list Thurrock Council will submit to Highways England. Of course this list below is only a suggestion based on your feedback, therefore items listed below may not be submitted via the council. Thurrock Council Task Force will have the last say in what they believe is the overall top ten items – based on a much wider approach to borough issues. However, we hope this will influence the final list submitted as this is what matters to us the most. 4) Traffic Simulation (Borough Wide Data [fed from Thurrock transport forum] and Highways England for SRN routes). Develop with Thurrock Task Force; plant, equipment, excavations, vehicle routes, materials in and out of the construction area etc. Review planned / expected impacts to local communities during this phase. List of roads open / closed to enable construction around interfacing roads. Up front Contingency Planning & Containment Action Plans for all aspects of delays during installation. Will the open date get pushed back or will they work more hours to maintain launch date? Action plan to mitigate traffic between Dartford & Thurrock on the M25 & A282 (as its clear Route 3 resolves none of these concerns). Considering the crossing is operating 6million crossings above design capacity per year, Thurrock & Dartford will face continual issues even after this new route is open. Sustainable Transport options for ALL NEW housing developments, not just cycling or electrification of vehicles. Think Network! Properly resource developments with infrastructure before developments are constructed. 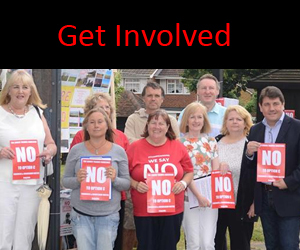 Lobby Government on Rail Investment – Remove where possible HGVs from Thurrock’s roads. What will Thurrock look like in 2050? 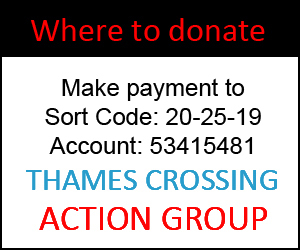 On behalf of the Thames Crossing Action Group I would like to Thank each of You for your commitment to date, and wish you & your families a Happy Christmas & Healthy New Year.